There are a few things that make almost everybody happy. Paid time off. Puppies. Massages. Skipping a few (wink wink). And chocolate! Who doesn't love chocolate? Well it's okay if you don't, but it seems like ever since someone decided that dark chocolate and nuts are good for you, it's even OKAY to love chocolate! Finding chocolate that is enjoyable, affordable and still “healthy” is often the difficult part with chocolate. I mean, lobster is even healthy, but it's not like we can afford to eat it all the time! Back to chocolate. Mass-produced chocolate like Hershey's and even nicer varieties are often waxy, lack great taste, plus are often loaded with more fat and sugar to make up for less real chocolate. On the other end of the spectrum, there is luxury chocolate like truffles from Godiva. Wonderfully rich and tasty, but also wonderfully expensive and not so healthy either. Dark chocolate has just enough sugar to make it enjoyable, but the antioxidants and even fiber are what has people buzzing about chocolate. But with nice chocolates, truffles and ganaches, there's often enough butter and cream to pretty much negate the chocolate benefit. I enjoy a handful of dark chocolate chips and almonds as a healthy and delicious snack or dessert sometimes. But why not one-up it? Make a little more indulgent version of this snack that’s almost as healthy as straight dark chocolate and almonds but has the class and delight of Godiva and the ease and price of Hershey’s. Make your own marzipan – in just a couple minutes! I’m not talking about spray-painting little molded fruits for three hours. 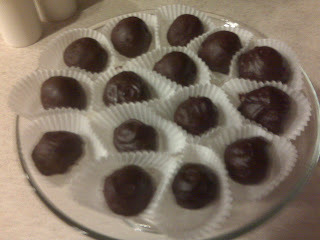 I am talking about making balls of canned marzipan and rolling them in some melted dark chocolate on the stove. Let them harden for a few minutes in the fridge on a plate or in mini cupcake wrappers like you see store-bought chocolates in. Believe me – they will look, and more importantly, taste, like a fancy marzipan truffle. Julia did the dipping of these quite artfully, but adequate dipping will not be that hard to get the hang of. And it will take you 5 minutes! They have a great, soft texture when just cooled, where the chocolate is hardened but not brittle. It literally is like biting into a soft, little puff of beautiful chocolate-almond joy! If you are not familiar with the canned marzipan, it is exactly what it sounds like – amazing right? And the only ingredients in the can are almonds and sugar, so while it is a little sweeter than the classic snack, the fat still only comes from the natural fat of the almonds and cocoa. You can find the Love ‘N Bake can of marzipan in grocery, craft and specialty food stores and can make these beautiful (see picture) delights for a special little dessert. There is no way that I’ll forget about these treats, and I’ll most likely be begging for them or making them (less prettily) myself quite frequently in the future. And you should too! It’s chocolate! It’s meant to make you happy, right?